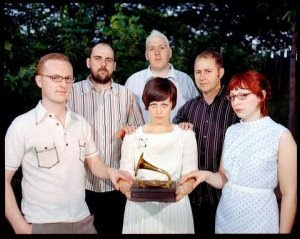 - Camera Obscura at Metro - Indie pop from Glasgow. Last month the band released their fourth LP, My Maudlin Career. Also with Agent Ribbons. Doors at 8 p.m., show at 9 p.m., $17.50, 18 and over. More info and tickets. - Viva Voice, Cut off Your Hands and Beaujolais at the Empty Bottle - 10 p.m., $12, 21 and over. More info and tickets. - Gehenna at Silvie's Lounge - Gehenna is an up-and-coming local three-piece worth checking out. See my recent Q&A with the band to learn more. Doors at 9 p.m., $5, 1902 W Irving Park Rd. - Do-Division Street Festival with Flosstradamus, Handsome Furs, Viva Voce, JC Brooks & the Uptown Sound, Dark Meat and Lamajamal - This fest spans 10 city blocks and features music all day sponsored by the Empty Bottle. The fest also takes place on Sunday, with performances by Menomena, White Rabbits, Hollywood Holt, Mt. St. Helens Vietnam Band, Jai Alai Savant and Bad Veins. Suggested donation of $5, all ages. Click here for set times and more details. - Th' Legendary Shack Shakers and Catfish Haven at Double Door - Psychobilly from Nashville paired with Chicago indie soul. Also with Tangleweed and The Wabash Cannonballs. Doors 8 p.m., show 8:30 p.m., $13 advance, $15 at door, 21 and over. More info and tickets.